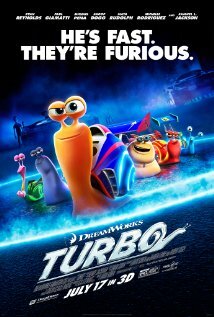 Summary: A freak accident might just help an everyday garden snail achieve his biggest dream: winning the Indy 500. Other Subculture Media Reviews of ‘Turbo′: Please check The Good The Bad The Ugly Film Show Episode 50 for our more in-depth review of ‘Turbo’. Summary: 8 players with 703 years between them compete in the World over 80s Table Tennis Championships in Inner Mongolia. 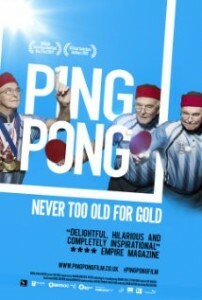 Terry (81) having been given a week to live, gets in sight of winning gold. Inge (89) has used table tennis to train her way out of the dementia ward she committed herself to. Australian legend Dorothy deLow is 100, and finds herself a mega celebrity in this rarefied world and Texan Lisa Modlich, a new-comer at 85 years old, is determined to do whatever it takes to win her first gold. 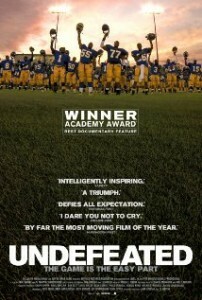 This film is as much about the tenacity of the human spirit as it is a meditation on mortality. 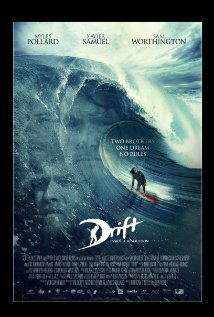 Summary: Based on true events, Drift is a story set on Australia’s spectactacular and rugged coastline in the early 1970s. It begins in a remote coastal town with the two Kelly brothers, who spend their youth searching for the perfect wave. Out of necessity the family launch a backyard surf business; re-thinking board design, crafting homemade wetsuits and selling their new surf gear out of their van. Battling killer waves, small town conservatism and hard-core criminals, the brothers persevere, daring to dream of a world where they can surf to live and live to surf. A story of passion and corruption, deadly addictions and fractured relationships, Drift tells a tale of courage and the will to survive at all odds. Dave Griffiths’s ‘Drift’ Review: Please check Dave’s review of ‘Drift’ that is available on the Helium Entertainment Channel. Other Subculture Media Reviews of ‘Drift′: Check Episode #30 (available 2nd May, 2013) of our The Good The Bad The Ugly Podcast for a more in-depth review of ‘Drift’. Summary: Gus Lobel (Clint Eastwood) has been one of the best scouts in baseball for decades, but, despite his efforts to hide it, age is starting to catch up with him. Nevertheless, Gus—who can tell a pitch just by the crack of the bat—refuses to be benched for what could be the final innings of his career. He may not have a choice. The front office of the Atlanta Braves is starting to question his judgment, especially with the country’s hottest batting phenom on deck for the draft. The one person who might be able to help is also the one person Gus would never ask: his daughter, Mickey (Amy Adams), an associate at a high-powered Atlanta law firm whose drive and ambition has put her on the fast track to becoming partner. Mickey has never been close to her father, who was ill-equipped to be a single parent after the death of his wife. Even now, in the rare moments they share, he is too easily distracted by what Mickey assumes is his first love: the game. Against her better judgment, and over Gus’s objections, Mickey joins him on his latest scouting trip to North Carolina, jeopardizing her own career to save his. Forced to spend time together for the first time in years, each makes new discoveries—revealing long-held truths about their past and present that could change their future. Timberlake is Johnny Flanagan, a rival scout who has his sights on a career in the announcer’s booth…and has eyes for Mickey. 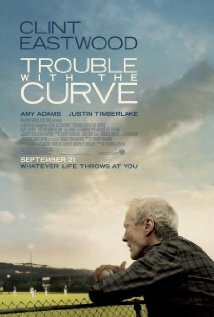 ‘Trouble With The Curve’ desperately wants to be as good as ‘Moneyball’, yet at the same time wants to take a swipe at its main belief… that modern day baseball scouts can now be replaced by a computer. Sadly though the writer of ‘Trouble With The Curve’ hasn’t developed a script just as good, despite that though the film remains a good watch. Gus Lobel (Clint Eastwood – Gran Torino, Million Dollar Baby) is one of the finest baseball scouts that America has ever had. His track record speaks for himself and he feels that he is safe in his job with the Atlanta Braves despite the fact that he is keeping a big secret – the fact that he is slowly losing his eyesight. 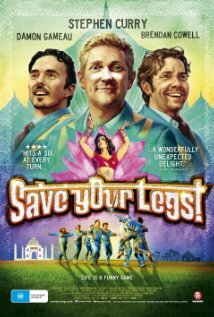 But when the likes of Phillip Sanderson (Matthew Lillard – Deep Dark Canyon, TV’S Criminal Minds) begin to put pressure on Gus’ immediate boss, Pete Klein (John Goodman – Flight, Argo) it seems that Gus’ days in his job may be numbered. Phillip keeps on saying that computers can now determine whether a player should be drafted or not and when Gus’ ideas on a rumoured number one picks seems to be different to everyone else’s it looks like Phillip may be right. Despite the fact that Gus’ daughter, Mickey (Amy Adams – The Master, On The Road) feels that her father has neglected her over the years she travels to be with him when she learns about his failing eyesight. While the two scope the new recruit they are surprised to find help in the form of Johnny Flanagan (Justin Timberlake – In Time, Friends With Benefits), a player that Gus once scouted but was injured thanks to a mistake by team management. The major weakness with ‘Trouble With The Curve’ is that screenwriter, Randy Brown has just made too many of the major storylines in the film too obvious to pick where they are going and then in similar fashion made the so called ‘evil’ characters such as Phillip so one dimensional that they just become the token bad guy… almost unbelievable. But then on the other hand Brown gets a lot of things right. 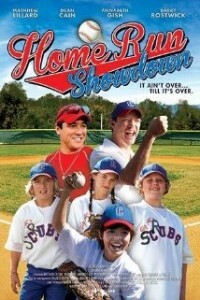 The secret that has caused tension between Gus and Mickey for so many years is brilliant (and certainly can’t be picked early on) while the fact that Brown has also written the scenes between Mickey and Johnny in such a way that the film has a romantic drama storyline rather than making it a stock standard romantic comedy also shows great skill. Anyone expecting a huge acting effort from veteran Clint Eastwood shouldn’t get their hopes up, he simply plays the grumpy old man role that he has been doing so well over the past few years. Instead the winners here are Amy Adams and Justin Timberlake. Timberlake again shows why he deserves respect as an actor while Adams puts the past sin (known as ‘The Muppets’) behind her with a serviceable performance. 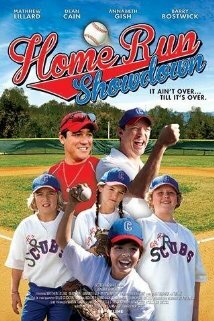 ‘Trouble With The Curve’ is nowhere near as good as ‘Moneyball’ but is still a good watch and will be enjoyed my males and females alike even if they know nothing about baseball. 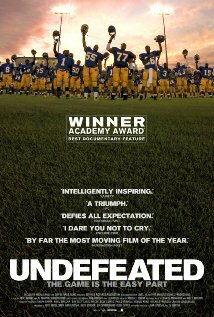 Summary: Winner of Best Documentary at the 2012 Academy Awards, ‘Underfeated’ is an intimate chronicle of three underprivileged student-athletes from inner-city Memphis and the volunteer coach’s mission to help them beat the odds – both on and off the field. The 2009 Summer/Fall football season promises to be the Tigers’ best ever – perhaps the season that finally breaks the 110 year-old playoff jinx. It’s the senior year for the team’s star player, O.C., a left tackle blessed with power, size and speed. With football scholarships hanging in the balance, O.C. will have to juggle practice with the study sessions he needs to pass crucial exams. Also playing his last season is undersized offensive lineman Montrail – known to all as ‘Money’ – an earnest honors student hoping to score an academic scholarship. For Chavis, a talented linebacker in his junior year, the challenge of 2009 lies in keeping his explosive temper in check – something the willful teenager isn’t always interested in doing. As the football season intensifies, tensions mount and tempers fray, it’s up to the tireless efforts of Coach Bill Courtney to keep each player focused on one thing – his future..